This is part I in a series of advice for new riders. 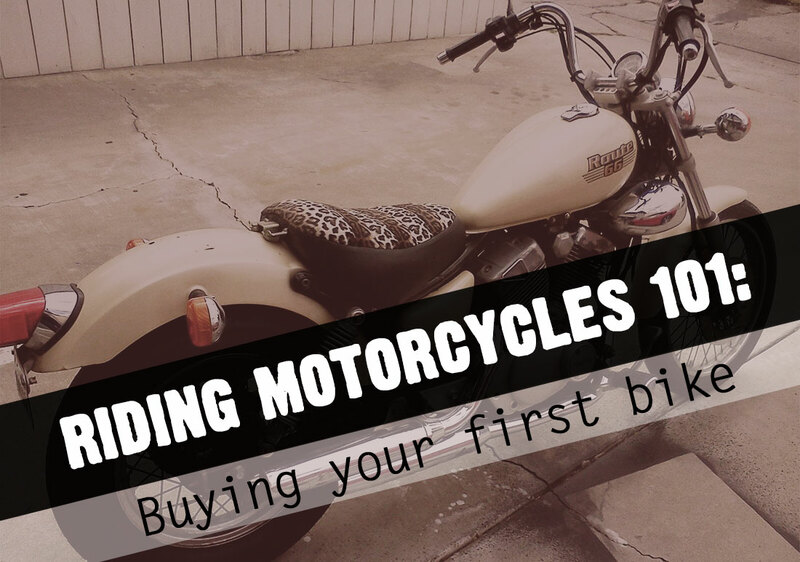 Stay tuned for tips on learning to ride, buying the right gear, and other things we wish someone would’ve told us when we were first starting out. We all have to start somewhere. Some start on dirtbikes, quads, or scooters, some on low cc street legal starter bikes, and some crazy bastards go straight from zero to buying their dream motorcycle. Whichever way you decide to go, here are some tips for picking a first bike that is right for you. First, decide what type of bike you like. Are you into Harleys, café racers, sport bikes, choppers, British, Japanese, cruisers, adventure, touring, or something completely different? It’s okay if you don’t know. The nice thing about first bikes is that you’re likely to grow out of them and move onto something different. For me it was fairly easy. I always knew I wanted a Harley, but when I first started riding, there was no way I could afford one. And even if I did, I didn’t want to buy an expensive bike that I’d inevitably end up dropping or otherwise bang up from lack of experience. So I went with the next best thing: a cheap Japanese cruiser. My first bike was a yellow 250cc 1988 Yamaha Route 66 that I got at a tow yard for $300. It had constant carb issues and was way too slow to safely take on the freeway. But I rode it around my neighborhood for a few months until I felt completely comfortable shifting, stopping, starting, parking, turning, etc. All those things you have to imprint on your muscle memory to become a safe rider. It’s also worth taking into consideration what type of riding you’ll be doing. Are you commuting to work, going on long road trips, riding off-road, track racing, or just riding around town? All these are aspects worth considering when deciding which bike to buy. I have a friend who started riding around the same time I did. She always wanted a Triumph Bonneville, but at only 4’11”, it was difficult to find one low enough for her to ride. She ended up getting a Speedmaster instead, which is more of a cruiser-style motorcycle, but still a Triumph. Moral of the story is: find a bike that’s right for your particular build. Honda Rebels, Yamaha Bolts and Harley-Davidson Sportsters are examples of good starter bikes with a lower seat height for vertically challenged riders. This RideApart article has some other good suggestions, if cruisers aren’t your thing. For a more sporty first bike, look into the Kawasaki Ninja 300 (or the older model, the Ninja 250), the Honda CBR300, or the Yamaha R3. Each of these bikes is a smaller version of the 600 series counterpart, and they are well-suited for beginners and experienced riders alike. Some women end up riding the 300 series sport bikes for a long time because they’re quick enough for highway use, and have shorter seat heights than the larger displacement versions. For taller riders, try finding a bike with forward controls that allow you to extend your legs. Going with a dual sport is another option, since those tend to be taller than average and not cramp your riding position. Of course, for many, one of the main obstacles when it comes to buying a new bike is money. If you’ve been riding for a few years and know exactly what you want (or, I guess, if you’re just flush with cash), it might make sense to commit to the more long-term investment of buying a brand new bike. But when first starting out, buying a cheaper, used bike is usually the smartest option. You will drop it. Things will break. You might scratch the paint. When this happens, it’s nice to know you didn’t spend your life’s savings on a pile of garbage. Most older motorcycles are also fairly easy to customize. Slap some new handlebars, a seat, some paint, and a sissy bar on that bad girl and go ride your *custom* motorcycle around as much as you possibly can. Then once you’ve decided that motorcycles are your thing, start saving up for your dream bike. If you live in the US, Craigslist is your friend! Use it to research what the bikes you’re looking for are going for in your area. If you find one that’s priced way too low, avoid it! It’s usually a scam. When going to look at a bike, bring along someone who know knows motorcycles and who can test ride it for you (unless you’re comfortable enough to do it yourself). Look for any suspicious leaks, weird noises, smoke, tire wear, rust, and other signs of poor maintenance. This might not be a popular opinion, and I’m slightly embarrassed to admit it, but whenever I find an ad for a bike I’m interested in, I have my boyfriend make the initial call to the seller. In my experience, men who are selling bikes (and it’s almost always men) are more likely to take other men seriously. I’ve had several guys not return my calls or emails, but once my boyfriend calls, those same people will get back to him right away. It’s insulting as all hell, but it’s the way it goes, unfortunately. Once I show up on a Harley, these guys are more likely to let me test ride whatever old piece of junk they’re selling. As a woman, you often have to be twice as knowledgeable to be taken half as seriously, which is not a great position to be in as a beginner. But don’t let it deter you! Especially in the older generation, dudes are just not used to women riding their own bikes, but will usually warm up to the idea quickly – and they might even give you a good deal for the novelty of it. Great post! As a newbie to bikes, I found/find it particularly daunting when buying a bike because I don’t really know enough about the mechanics and electricals of a bike to know if I’m being sold the real deal. I found this article http://www.bikeexif.com/how-to-buy-a-motorcycle especially helpful also as a checklist on things to look at when buying a bike that gave me a bit more confidence when shopping around. That’s a good link! When I was buying my first bike, I brought along a more knowledgeable friend to take a look at everything with me too. And a lot of private sellers won’t let you test ride, so you might have to trust the rest of your inspection to make your decision. My husband loves motorcycles and really wants to buy one, but doesn’t know how to start. That is a good idea to consider what kind of riding he will be doing with it. That would really help him narrow down the type he wants. Thank you for the tips!